The Yale Day of Data 2015 will host a day-long event held on the Yale campus at Kroon Hall on September 18. The planning committee is seeking expressions of interest for presentations. The theme for this year aims to highlight research collaboration with partners across Yale. Proposals for group or collaborative presentations are encouraged. A short abstract (~300 words) of your presentation should be submitted to michelle.hudson@yale.edu by June 15, 2015. The intended audience of the symposium includes faculty, administrators, graduate students, postdocs, undergraduates, and research support professionals across Yale. Two previous Day of Data conferences were held in 2013 and 2014, focusing on disciplinary challenges for working with data, and collaboration across academia, government, and industry. For more information about the previous events, including videos of presentations, slides, and posters, click here. SML will be closed to the public until 3:00 pm, opening to users only 3:00-4:45 that day. Bass Library will be open its usual hours, 8:30 am to 9:45 pm. The tunnel between Bass and Sterling also will be closed until 3:00 pm. Because Commencement can be a heavy return day, the outside SML bookdrops will remain open until 3:00 pm, after which books can be returned inside the building. Until 3:00 pm on May 18, the access point into and out of SML will be on York Street. After 3:00 pm, access will return to the High Street and Wall Street doors, and the York Street and loading dock entrances will close. The SML nave and adjacent spaces such as the nave service area, the public tower elevators, and the L&B, Franke, and Starr reading rooms will all be completely inaccessible from 11:00 until 2:30. Eli Express deliveries will take place that day, although schedules and delivery times may be adjusted depending on street closures. Please be certain to carry your Yale ID with you at all times throughout the day. 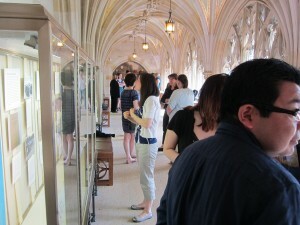 The exhibit corridor in Sterling Memorial Library currently features an exhibit celebrating Student Research at Yale University Library. The exhibit will be on view through the end of October 2015, and features research projects by four Yale students, shown here left to right at a reception for the opening of the exhibit: Andrew Cordova, History, Silliman College ’15; Caroline Sydney, Humanities, Silliman College ’16; Miranda Melcher, Political Science, Branford College ’16; and Scott Stern, American Studies, Branford College ’15. 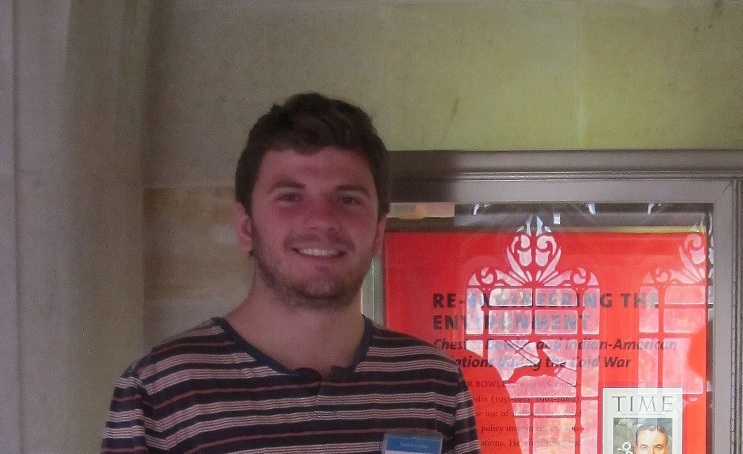 Manuscripts and Archives is happy to highlight the work of Andrew Cordova, who has worked in the department as a student assistant for the past two years, digitizing collection material for patron requests and doing quality control for the Kissinger Papers digitization. 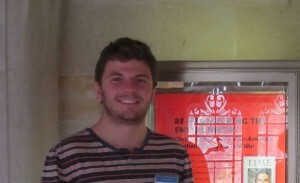 Andrew’s senior essay, “Re-Engineering the Environment: Chester Bowles and Indian-American Relations During the Cold War,” was done under the supervision of Associate Professor of History and American Studies Paul Sabin and heavily engaged the Chester Bowles Papers (MS 628) in Manuscripts and Archives. Several images from the Bowles Papers, including two used in Andrew’s student research exhibit case, are viewable in the Manuscripts and Archives Digital Image Database. Bowles, among other public service posts, served as United States ambassador to India and Nepal from 1951-1953 and again from 1961-1969, and it is on this aspect of his career that Andrew focused in his senior essay research. He argues that Bowles “criticized the military as an instrument to influence foreign policy during the Cold war [and] that it damaged America’s reputation as the protector of freedom.” Cordova explores Bowles’ desire “to build partnerships that satisfied the needs of foreign governments while ensuring U.S. national security issues. 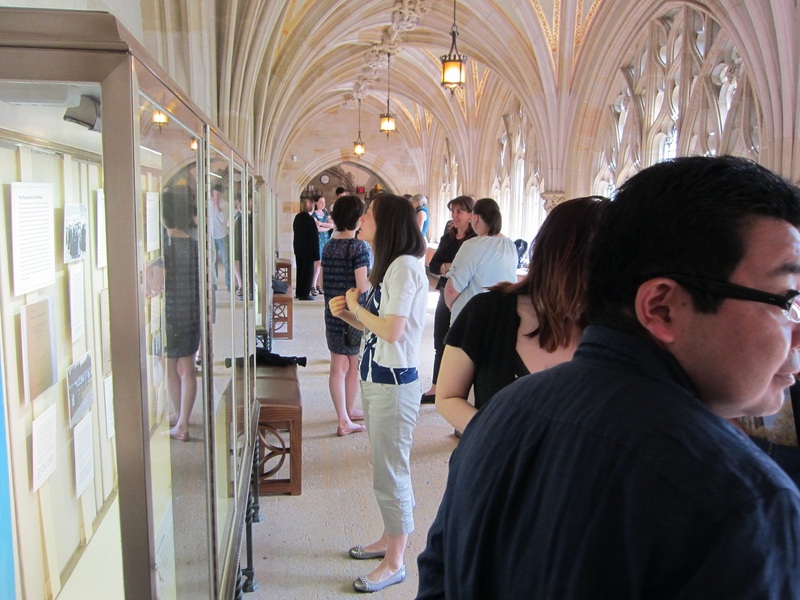 Student Research Exhibit reception attendees in the corridor at Sterling Memorial Library, 13 May 2015. The reception for student curators that marked the opening of the exhibit was a relaxed send-off to Andrew and co-curator Scott Stern, both of whom will be graduating from Yale College this coming Monday. Andrew will be heading for Alaska for a year of non-profit work in fisheries management before starting law school, focusing on environmental law. 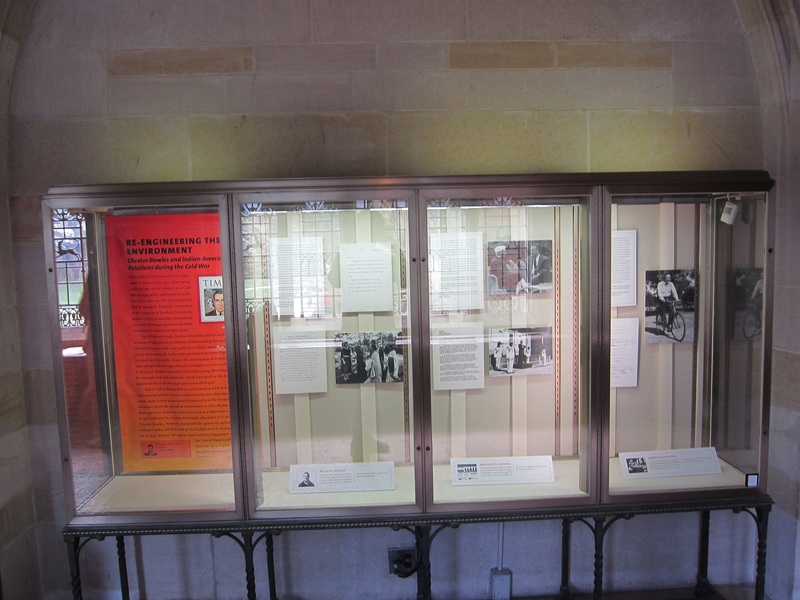 This first annual exhibit in the Sterling Memorial Library Exhibits Corridor highlights four Yale students’ exceptional research at the Yale University Library. The subjects represented are as diverse as the Yale Library collections and convey a combination of both complete and ongoing research. Students share key library resources important to their research ranging from online databases to favorite study spaces. 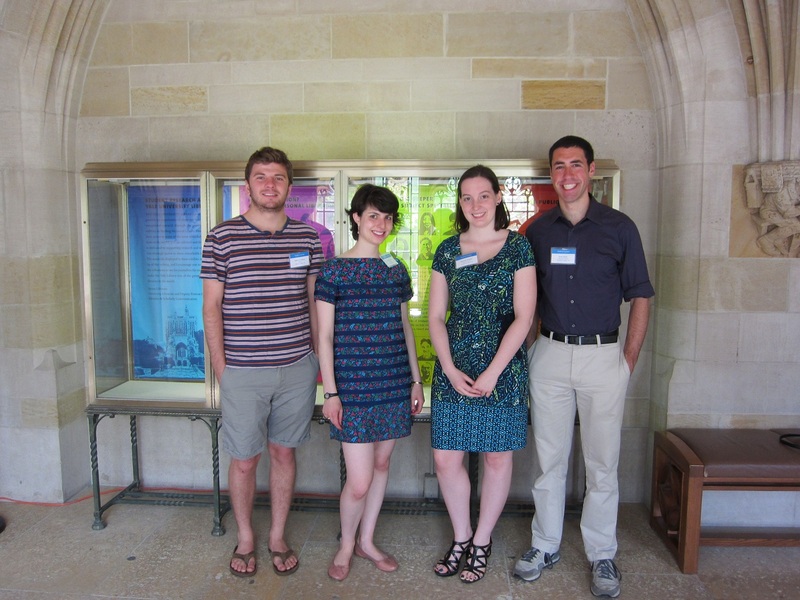 This year’s student curators are Andrew Cordova, History, Silliman College '15; Miranda Melcher, Political Science, Branford College '16; Scott Stern, American Studies, Branford College '15 and Caroline Sydney, Humanities, Silliman College '16. The exhibit will be on view in SML through the end of October. Any Yale students interested in contributing to future library exhibits can click here for more information. Winners of the 2015 Lohmann & Van Sinderen Prizes in Undergraduate Printing and Design were announced at last Friday’s judging ceremony in Haas Family Arts Library Special Collections. This year saw more than twenty entrants and featured a wide variety of personal, academic, and professional pieces made individually and collaboratively. All of this year’s participants are to be congratulated on the quality and imagination of their work. This year’s first prize was awarded to Cindy Hwang (BK ’15) for her body of work, including a reversible poster for WYBC Radio’s Ante-Fling, books for campus publications Dimensions and The Yale Literary Magazine, and a pamphlet for Berkeley College’s Commonplace Society. Mariah Xu (SM ’16) was awarded second prize for her body of work, consisting of an art book of photographed intersections, a fold-out timeline documenting the life and work of designer Max Huber, and a series of Yale-branded pieces for the Yale Map Collection, in addition to her professional pieces. (JE ’18) for his Small broadside, Katherine Rosenberg (ES ’18) for her Catulli flag book, and Sara Cho (BR ’18) for her accordion-style book, The Chair that No One Sits On. The judges for this year’s competition were John Gambell, Basie Gitlin, Rebecca Martz, Emily Monjaraz, Wynne Patterson, Richard Rose, and Jae Rossman. Linked Jazz is an ongoing project investigating the potential of the application of Linked Open Data (LOD) technology to enhance the discovery and visibility of digital cultural heritage materials. More specifically, the project focuses on digital archives of jazz history to expose relationships between musicians and reveal their community’s network. New modes of connecting cultural data and making them searchable as a whole in a seamless discovery environment would open up unprecedented opportunities to create new kinds of meaning and elicit new streams of interpretation. The goal of this project is to help uncover meaningful connections between documents and data related to the personal and professional lives of musicians who often practice in rich and diverse social networks. Matthew Miller is Head of Semantic Applications & Data Research at NYPL Labs and Visiting Assistant Professor at the School of Information and Library Science at the Pratt Institute. He holds a dual master’s degree in Library and Information Science and History of Art from the Pratt Institute. This talk is sponsored by SCOPA. The Digital Humanities Lab and the Digital Humanities Working Group hosted a talk by Miriam Posner, Program Coordinator of Digital Humanities at UCLA on May 4 in the Hall of Graduate Studies. Posner holds a Ph.D. from Yale University in Film Studies and American Studies; her research interests include medical filmmaking and the way doctors have used film to make sense of the human body. Her talk was titled, "Fostering A DH Project within the American Studies Paradigm: Ways & Means." If you’d like to know more, here’s an interview with her in Figure/Ground, and here’s a story in the Chronicle of Higher Education that features her teaching.